I hesitated to write this post. I like to think of my blog as inspirational and everything. Unfortunately when things are not going so well, I use that as an excuse not to post. And then I get out of the habit, and there are no posts for months. I realize I have to be willing to share my challenges along with the wins. I can't always be inspirational. Sometimes I just have to be genuine. Last May at the LDStorymakers conference I made a small blunder; one that just keeps growing. I pitched a book that wasn't finished. To be fair to myself, it was supposed to be finished by the time of the conference. Once we decided to move, I knew that would throw the writing schedule way off. But I figured the book would be done soon after the conference and so I went ahead and kept the pitch session. The agent loved the idea. She wanted to see the whole manuscript. The manuscript that I didn't have. Ten months later (!) I still don't have a manuscript to send to her. But it's not for lack of trying. I have made some pretty hefty sacrifices to try and squeeze one or two hours of writing time out of my day. It's exhausting, especially given the slow progress. Part of the problem is that I made some significant mistakes in the original outline that required not one but two rewrites. Massive rewrites that have taken far too long. But necessary rewrites, and I believe the story is much better for them. 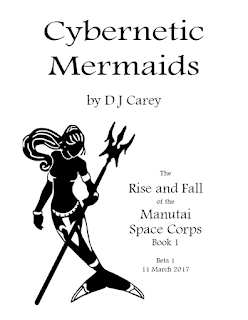 Last week I finally sent out a beta draft of Cybernetic Mermaids (working title, formerly known as The Space Corps General). The feedback has been trickling in, and while it has been positive it also confirms what I already know: This book still needs a lot of work before I can send it to an agent. I really wanted to have an agent in time for this next LDStorymakers in May. Or at least a rejection from an agent. Something that shows I've made some progress from last year. But now I'll be doing good just to have the draft submitted by the time the conference rolls around. And a full year after it was requested? Terrible form. But it is what it is. With my book in the hands of beta readers, I took this past week off from writing. I was surprised how much I absolutely missed it. I only have a little bit of feedback so far, but it's enough to start the revisions bright and early tomorrow. "There were quite a few jokes that had me laughing, too, or at least smiling. Overall, good job, Daddy. I'm excited to keep reading." Wow, I could have written this post. My blog has been neglected for a long time, and the same thing happened to me several years ago at the conference. I pitched a book that was nearly finished the revision stage, but then things happened after the conference and the revisions didn't get finished in time. The important thing is that you didn't give up and are still working at it. And I love the feedback from your daughter!